Wine is one of the drinks that is preferred in all kind of occasions right from birthdays to funeral. Wine reminds of extensive vineyards of France as well as Italy. Not to forget the grapes stomping party where grapes are collected and people squash it with bare feet and then the juice is taken for fermentation. Hints of wine production was found in Georgia during 8,000 B.C., this means that for 10,000 years wine has been in business. It was the Romans who made wine a special drink by using it on all occasions and events. They had their red glass in their hands every time. Church too supported its production and declared it to be a special drink. Although Islamic culture tried to prohibit it, but couldn’t do so and now eventually wine has spread all over the world. Its production started in Georgia and now has vineyards at famous locations like Burgundy, Champagne and Bordeaux. Wine is good when it is old and for aging of wine barrels are used. They are made of oak and keeping wine in it for a long time allows them to take certain features of timber. Oak was used to make ship during Napoleon’s time. However, now those ships aren’t in demand therefore, they are being used to make wine barrel. Also, oak wood is tight and firm with butter, vanilla and spice flavors, which create different characteristics of wine. The type of oak used for aging decides the quality and personality of wine. Each time this process is repeated the flavor of oak reduces until its contribution is nil. Later, this barrel is sent to make brandy or any other liquor or sold off to different dealers or to prepare firewood. Isn’t that a waste of such a powerful piece? Therefore, instead of wasting this wood we can reuse it in any form to decorate our house or any other premises. They can be prepared as pots for various plants. Since you can be sure because of its tight grains, water or mud cannot escape. Prepare them as drink cooler for outdoor parties during summer. If you cut them neatly into two parts, then they can be made as swings and since oak was used to make ships, you cannot doubt its strength. They can also be used to make chairs and tables and you don’t need to color them because the natural look is quite appealing. How about making a side table or decorate your living room with barrels filled with décor pieces? How can we forget that because of its tight grain property, it can be created as barbecue smoker or fire pot? It allows to burns charcoal nicely. 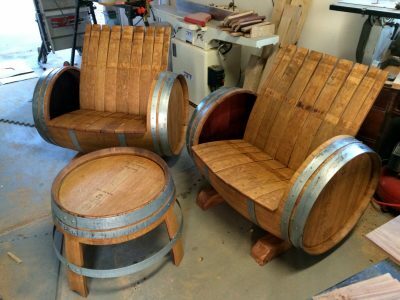 There are various ways through which you can use wine barrel. You will definitely not be disappointed if you decide to give some sophisticated look to your house. This article has been written by Stephen Tomalin. Hungarian workshop is situated in Las Vegas, Nevada where they have various options of latest designed furniture made out of barrels. All you have to do is follow the link ungarianworkshop.com. Due to its unavailability in the market, the price of barrels has been hiked. If you want to get your wooden furniture at a reasonable price then visit their website today.